This last minute Thanksgiving appetizer will totally impress your friends and family! I love that it is a meat free appetizer so you will not fill up on proteins that typically has the satiating factor. Plus – I am sure you will be meeting your protein needs with all of the turkey and ham! Keeping your portions in check and being mindful of what you eat before the big Thanksgiving day feast is crucial to prevent over-eating. One of my tips this Thanksgiving is to make sure you eat breakfast! Many families have Thanksgiving dinner in the afternoon and can forget about breakfast due to the anticipation of all the food they will be eating later on. But this most almost always leads to consuming more calories than you necessarily need. To prevent this try to remember to eat a breakfast that day – something with protein, carbs, and healthy fats to keep you satisfied throughout the AM. Bottom line is to have a balanced breakfast so you’re not too ravenous by the time the turkey hits the table. 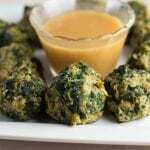 Another tip regarding appetizers, keep the appetizers light like these Spinach Balls. These are less than 100 calories per serving but will leave you feeling content. They are super easy to make too! Happy Thanksgiving to all! Start by heating your oven to 350 degrees. Next wash your hands, cause you're gonna use them as mixing tools. In a medium bowl combine all ingredients and mix together using your hands. I once heard that touching your food makes it taste better...so dig in (clean hands of course!) Once all ingredients are well combined form 1 inch balls. Please them on a baking sheet that has been sprayed with non-stick spray. Whisk all ingredients together and transfer to a small saucepan. Bring just to a boil whisking the entire time. Can be served warm or at room temp. Awesome tip about breakfast! Very often I get wrapped up in cooking and snack every now and then – but it definitely leaves me hungrier later! 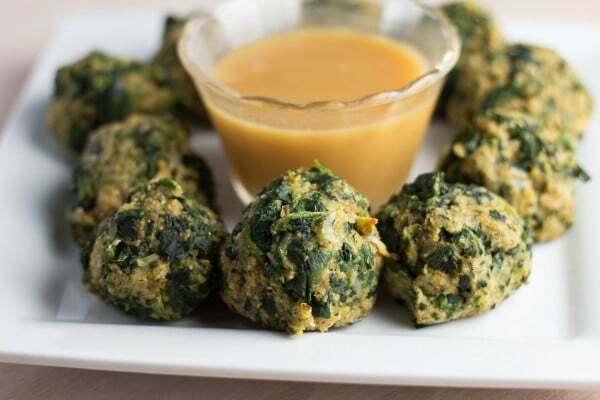 As for these little spinach balls – they are indeed the perfect side – but not just for Thanksgiving or Christmas – these are definitely delicious for everyday! YUM! This looks amazing! What a great recipe! Happy Thanksgiving! 🙂 And I couldn’t agree more about eating breakfast! It’s SO important. I made sure to eat a balanced meal when I woke up this morning. Thank you Cailee! Super easy and healthy 🙂 hope you had a wonderful day! Can these be made ahead of time? A day before?? These were awesome! My husband’s favorite part of the many Christmas meals! Thank you! This sounds fantastic. I am going to try it next week.